This book is only available in digital formats. A range of products, often referred to as alternative fertilisers, are marketed with numerous claims relating to soil health and improved plant growth. However, there is often an absence of evidence about the veracity of the claims and the effectiveness of these products. Producers and consumers alike are left to rely on the advertised promises which come with little proof. This publication is available to download below and is also available from the iBookstore and Google Play in the right panel. 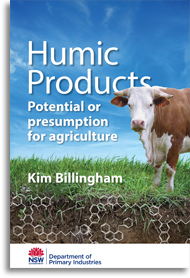 This e-publication is written primarily for agronomists, soil scientists, consultants and other farm advisors. However, the readable style, explanations and diagrams make it accessible for others with a more rudimentary understanding of the soil and plant services.